Q. Where exactly is Dubai? A. Dubai is a city in the Middle East. It is one of seven United Arab Emirates. It is adjacent to Saudi Arabia, within three hours of India, four hours to North Africa and within six hours of China and Europe. Its central location makes it a desirable vacation destination and a gateway to over 1.5 billion consumers. Q. Why has Dubai been attracting so much international attention as an investment opportunity in recent years? A. In May 2002 Sheik Mohammed bin Rashid al-Maktoum issued a decree allowing non-nationals to buy and sell property in selected developments. Before that time, only United Arab Emirates (UAE) nationals could own property, and even then, only on restricted land. Q. What type of development has taken place since Sheik Mohammed bin Rashid al-Maktoum issued his decree? A. Dubai has quickly become one of the world's most appealing foreign investments. It's been only a few years since the Sheik's decree, and it is no surprise that Dubai is the number one emerging market today. An estimated $80 billion of real-estate projects are now underway in Dubai. The appeal? Dubai offers a stable economy, zero property and income tax, and an unmatched standard of living. Q. Is the population in Dubai primarily people who were born in that country? A. Modern Dubai is home to a cosmopolitan population that has more than 140 nationalities. Almost three-fourths of its estimated three million population is comprised of expatriates from all over the world, making it a true melting pot of cultures. Q. What language is spoken in Dubai? A. Arabic and English are the dominant languages. Q. How would you describe Dubai to potential investors? A. It is a clean, ultra-modern, crime-free city. Over the past 50 years it has developed a state-of-the-art communications infrastructure, progressive hospitals and an amazing variety of shopping malls and value-filled souks. It has some of the best healthcare, education and leisure facilities in the Middle East. And it has a history of economic and political stability. Q. How would you describe Dubai to potential visitors? A. For visitors, it offers world-class hotels, restaurants, beaches and tourist attractions. Its internationally-renowned sports facilities include golf, tennis, water sports, horse riding, dune driving, sand skiing and the world's first indoor snow skiing. The factors fuelling the rush to Dubai include year-round sunshine, soft, white sand beaches lapped by a clear blue sea, non-existent crime and a relatively westernized culture. English is spoken everywhere. Women can drive and walk unaccompanied. Alcohol can be consumed at home, in hotels and on licensed premises. Q. I am Jewish. Can I invest in Dubai? Can I visit Dubai? A. Yes, the developer has informed us that "anyone can buy properties in Dubai regardless of religion and origin. And we have a lot of UK and US Jewish people living and working here. However, the problem is entry to the UAE (as with most countries in the Middle East). Holders of Israeli passports or Israeli entry stamps are a problem, the latter isn't such a big deal really (unlike ultra-conservative Saudi Arabia) but holding the actual passport is a direct refusal at check-in." Q. Freehold vs. Long-term Lease: I've heard that foreigners can not buy a freehold interest in Dubai. Is this true, and if so, then how is this property to be sold? A. At present there is no federal law to govern foreign freehold ownership of property in Dubai, so you are right. Therefore, these units are sold as 99 year leaseholds with automatic renewals for the cost of 100 Dirhans, which is roughly $27. However, in a few months they hope that the law of freehold ownership will change and the property will be transferred to a freehold instead of a leasehold at that time. Q. I've read that you get automatic UAE residency with purchase. Can you provide details? A. The customer and his/her immediate family (spouse and children) can get residency when he registers the apartment in the land department upon completion, essentially when he receives the key of the apartment. Q. How do you get to Dubai? A. Dubai's main airline, Emirate Airlines, serves the entire world and even flies direct to New York. In fact, here's a trivia fact for you. Emirate Airline is the most profitable airline in the world. Dubai International Airport is within 20 minutes reach of main locations of Dubai. The Airport continues to win internationally acclaimed awards, especially for its duty free shopping. The second international airport in Dubai, currently under construction, will be based 10 minutes from Dubailand called Jebel Ali International Airport. Q. When you compare the pricing of Dubai's five-star condo hotels with that found in condo hotels in other countries like the U.S., Dubai seems like a downright bargain. Why are the prices so low? A. Why look a gift horse in the eye, right? The main developer with whom we're working has built 75% of the middle east. He has Wal-Mart buying strength and can get construction materials for a fraction of what a small developer can get. Also, typically the land is 15% of a developer's cost to build a project. That's not the case in Dubai. How much does the land in a desert cost? We don't have a precise answer but let's just say, it's not like buying prime oceanfront land in Miami Beach or a lot on Fifth Avenue in Manhattan. It's sand! Q. Once I've zeroed in on a condo hotel property that I'd like to buy, how do I choose a specific unit? A. Condo Hotels Dubai can send to you our exclusive inventory list. You can choose to move forward on any of this inventory immediately. However, if you are not interested in a unit on our exclusive list, we will do everything possible to fulfill a special request for another floor or unit. We have an excellent relationship with the developers with whom we work, and accommodating requests is usually possible, although it may take a day or two to get confirmation because of the time difference between the U.S. and Dubai. Q. Is there a rescission period when you purchase property in Dubai? A. In Dubai, there is no rescission period as there is in most U.S. states. According to the developer, "The mentality is different here. We move forward fast based on trust and real commitment from purchases." Essentially, this means your deposit cannot be refunded. Q. What is the time difference between the U.S. and Dubai? A. Dubai is eight hours ahead of the U.S.
Q. What is the AED called as a unit of currency, a dollar, a pound, or is it simply referred to as an "AED?" A. AED is actually the three- letter code for the currency name Dirham (or UAE Dirham pronounced "Dearum"). It is comparable to USD, the three-letter code for US Dollar; EUR for Euros; and GBP for Pounds Sterling. Every country currency has this code, just as every airport has a three-letter code like MIA for Miami. It's an international ID. Q. How do I convert meters to square feet and Dubai currency to the U.S. dollar? A. By best approximation, to get sq. meters, divide sq. ft by 10.75, or multiply sq. meters by 10.75 to get sq. ft. The conversion rate is currently 3.66 AED to one dollar. This is a fluctuating rate. Divide AED by 3.66 to get close approximation of prices in U.S. dollars. Click here to get the current rate. Q. I've read that the "average temperatures in Dubai range from 24°C in winter to about 45°C in July." I don't remember my ninth grade science. How do I convert these temperatures from Celsius to Fahrenheit? A. As I recall it was something like take your Fahrenheit number, subtract 32, divide by 9/5ths, do the hokey pokey and turn yourself about. For ease, however, just click here for temperature conversions. Q. It seems like many of the condo hotels to be built in Dubai will be in the Dubailand area. What is Dubailand? Dubailand is destined to become the planet's biggest and best leisure, entertainment, and tourism destination. It will be divided into six immense "Worlds," each pulsing with state-of-the-art themed rides, world-class entertainment, awe-inspiring attractions, and the most sophisticated virtual reality games. It is a place being designed to excite, amaze and enthrall children and adults alike. When complete, Dubailand will be almost three times the size of Walt Disney World Resort and will attract Europeans, Asians and Arabs to come to Dubai, which is far closer for them than Orlando. Attractions and Experience World - 145 million sq. ft. - a world of vibrant characters, with its theme parks clustered around a landmark viewing tower and forming a "must see" attraction. The themed experiences and attractions for the entire family will form both a playground and a spectacle. Retail & Entertainment World - 45 million sq. ft. - An indoor and outdoor destination with innovative retail concepts in a themed and entertaining environment. Projects include: Flea Market, World Trade Park, Auction World and Factory Outlets. Themed Leisure and Vacation World - 311 million sq. 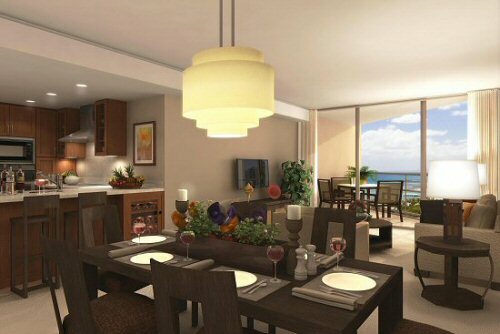 ft. - The creation of appealing retreats, quality vacation village residences and resort hotels. Imaginative and creative themed development concepts adjacent to major leisure and entertainment facilities and incorporating amenities such as formal waterfronts, canals, lakes and parks. 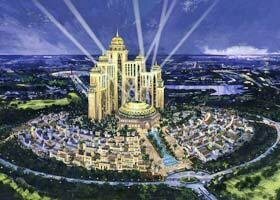 Projects include: Women's World, Destination Dubai, Desert Kingdom and Andalusian Resort & Spa. Eco Tourism World - 806 million sq. ft. - An area devoted to preserving the desert heritage of Dubai and creating a habitat for animals from the region to be showcased in their elements. Projects include: Desert Safari, Sand Dune Hotels, Desert Camps and Dubai Heritage Vision. Sports and Outdoor World - 206 million sq. ft. - A stimulating arena of outdoor sports activities and adventure. 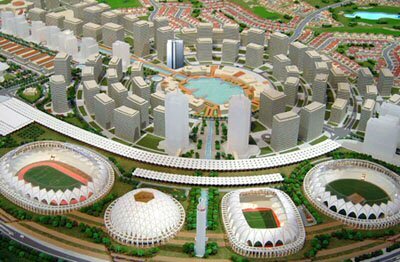 The activities will optimize the use of the expansive area to build facilities capable of hosting world events such as football, soccer, cricket, rugby, etc. Projects include: Indoor and outdoor venues, traditional and extreme sports, including Dubai Sports City, Emarat Sports World, Plantation Equestrian and Polo Club, Autodrome and Dubai Golf City. Downtown - 5.66 million sq. ft. A gateway to the overall development centered in Dubailand and forming the resort's downtown, business and administrative district. It will retain the open space and leisure character of the overall development through its landscaping, water features and grand scale squares and piazzas. Projects include: Mall of Arabia, the largest mall in the world, and City Walk with its art displays, entertainment and outside dining. It will also consist of wide boulevards, street cafes and theaters, lush parklands, lawns museums and common gardens. Finally, it will contain Virtual Game World, a cyber-heaven with 3D interactive games. Q. 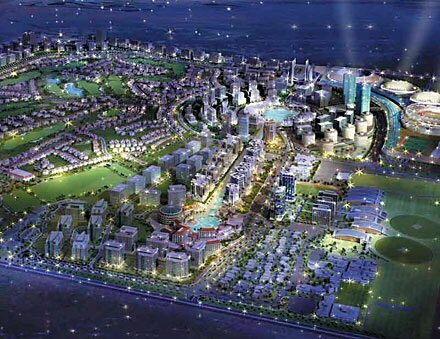 What is the reasoning behind the development of Dubailand? A. Dubailand is a tourism, entertainment and leisure destination. It was established with a simple mandate, to develop an initial critical mass of entertainment projects that will attract 15 million tourists to Dubai by the year 2010. The concept behind the development was to take advantage of the comparative geographical advantage that Dubai has of being within a 3-4 hour flying time range from Europe and Asia, thus having access to over a combined GDP of USD 1.1 trillion and 1.5 billion in population. Another factor that was considered was to strategically phase out the dependence on oil revenues and establish a sustainable economy through higher value-added services. Q. When was Dubailand launched? A. The work on Dubailand started long before its official announcement date of October 23, 2003. Projects were envisioned, their feasibility was established, the market demand was considered, and the final product that emerged was a development spanning over 2 billion sq. ft. in size with 45 mega projects and 200 sub-projects. Q. When will Dubailand be completed? Q. What are the time scales for its various phases? A. Dubailand will be completed in four phases. The first phase will see completion in 2007, with the ending phases following suit and completing from 2015-2018. Q. How does Dubailand fit into the overall framework of Dubai, of the UAE, of the region and of the world? A. Dubailand will not only be Dubai's entertainment location of choice, but it will represent the whole of the U.A.E as being the regions largest entertainment and leisure destination point, if not the world. Q. If I have additional questions or would like to reserve a condo hotel unit, what's the next step? A. Contact us at Condo Hotels Dubai. We'll answer all of your questions, explain to you the procedure for going forward and provide you with any necessary forms. We can be reached at info@CondoHotelsDubai.com or call us in Miami, Florida at 954-450-1929.